Growing Peanuts - All about how peanuts grow, how you can grow your own peanuts and the peanut plant! Welcome to GrowPeanuts.com! This website is fully dedicated to the most amazing nut on the planet: the peanut. This website specifically focuses on the growth process of the peanut. 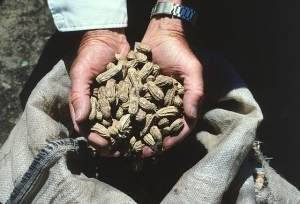 When you have read all the articles on our website you have all the answers to all your questions about peanuts such as how peanuts grow, how to grow your own peanuts, what is a peanut plant, what the growing season for the peanut plan is and much and much more. We also provide information about other nuts such as the pistachio and the almond. Articles include information about how almonds grow, how pistachios grow and information about the pistachio and almond tree. GrowPeanuts.com is also really useful if you have to write an assignment for school about peanuts or have to tell your classmates about almonds or pistachios. We also have a fact page where you can find all the fun facts about peanuts. In short: if you want to learn more about how peanuts grow, how to grow your own peanuts and also want to learn about almonds and pistachios then this is the right place for you! However, if you prefer a more academic approach towards the topic of peanuts we recommend you go to the Peanut Publication page of the University of Georgia. GrowPeanuts.com is W3C valid, which means that our website is also accessible for people with disabilities, older people and people in developing countries. After being online for only just a couple of months we already received our very first review! Stacy Anderson sent us the following success story on growing peanuts with her children. We are as stoked as you are Stacy! Many thanks. PS: If you want to submit your own review of your own peanut growing expirment do not hesitate to contact us! Your review will be posted on our website. You can also submit photos and videos if you want to. Good luck! Sometimes you feel like a nut! But how to grow one? The other day I was making peanut butter sandwiches with my children when they asked me where peanuts come fro.? I tried my best to explain that they were planted and similar to fruit, but I could tell that they wanted to know more. That's when I got the idea to actually plant peanuts with my children. Together we could answer the question and conduct a science experiment. And if we were successful we would also get a snack. When we started out the experiment we went to the store to get peanuts. Of course the children flocked to the honey roasted ones... I had to explain that the roasted peanuts wouldn't grow, we needed a peanut that hadn't been roasted yet. This is referred to as a raw peanut. Thankfully we were in luck, our grocery store had some! We were able to find peanuts still in their shell, that was preferred because the shell acts like a protective coat to the red skinned nut inside. The second step was to pick out the perfect pot! We went to the hardware store and picked up a plain ceramic pot and some paint (I thought it would be more fun if the kids could paint it first!). We also bought some potting soil. Once the children were done with their master piece (and it had dried) we filled the pot with soil (about 2/3 of the pot, this allowed room for the roots to grow and not over crowd the pot). The next step turned out to be the trickiest for my girls, we had to remove the shell and leave the skin in tack! The only reason it was difficult is the girls kept eating the peanuts, (this is where I learned my lesson, we had to go and buy more peanuts!) but eventually we were able to get several in tact and in the soil. We covered each of the nuts with about an inch of soil. We then took the plant outside and the girls started the waiting game. They painstakingly watered their peanut plant every day. Eventually they started to see sprouts in the pot. After a few weeks it was time to transplant the peanuts into the actual ground! We picked a good area in the back yard (I say a good area because we have a lot of clay around our home, so we needed to find a location where their wasn't much. Peanuts don't grow well in clay.). We dug out a hole about six or seven inches deep and the same circumference as the pot the peanut was already growing in. Carefully I helped the girls remove the plant from the pot and place it in the hole. We put more potting soil around the plant (being careful to avoid potting soils with nitrogen, peanuts produce plenty of nitrogen). Once we were done planing the peanut in the hole the girls watered it again and waited. Everyday they would check on their peanut plant, weeding any weeds, and watering it. They protected their plant from our dog (whom was very interested), and other animals that wanted a snack. Eventually the sign the girls had been waiting for, the leaves on the peanut plant beginning turning yellow! Truthfully I was getting worried, the peanuts have to be harvested before the weather gets to cold (and especially before a frost!). It is important when you harvest your peanut plant you use something that will not only get out the visible part of the plant (but also the peanuts underneath)! That was a lesson for us! I ended up going back to the hardware store and getting a spading fork. It was amazing to watch the girls as we unearthed a treasure! I let them take just a few of the nuts off the plant at this point (just so they could see that the nuts were not ready), and then we hung the plant to dry! This is an important step, if you want peanuts like you would find at the store. After three weeks the plant was dried out enough, the girls were able to start picking the peanuts off the plan, just like they were picking berries! This was the part they loved! Seeing all of their hard work paying off! We considered roasting the peanuts, but in the end we just ate them as they were! They were delicious! We are already making plans to plant more peanuts next year!! This was an amazing experiment for my girls, they learned a lot from just these two questions: where do peanuts come from, and how do they grow?